I (Jen with 1 ‘n’) recently went on my honeymoon and of course brought the PassingLEFT Austin shirts. I have loved all of the posts on where the shirts are being shipped and enjoyed seeing all of the different posts on the Facebook album Faces, Places, and Races. I thought it would be really cool to share with everyone where these shirts have been! My husband and I started in Munich, Germany and road tripped to Strasburg and Reims in France, then to Spa and Liege in Belgium, and then to Nurburgring and back to Frankfurt, Germany. So technically, since the shirts were in my suitcase, they went to all those places. But I have some photos to prove it. The Tune Up, Tone Up Austin shirt was worn in Munich. 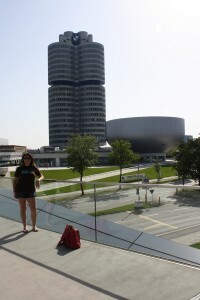 There is the BMW factory behind me! Side note: YES, we drove on the Autobahn. 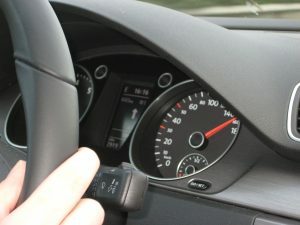 Here is a photo of the speedometer (not taken BY me) while I was driving. It’s hard to tell but it was driving about 160 kmp (about 100 mph). I was up to about 113mph at one point but my husband didn’t get a picture…a little too distracting! 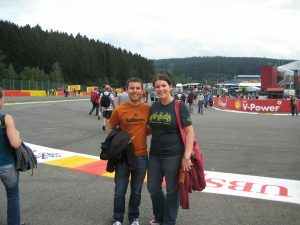 I saved my other shirt until we got to Spa. This was really the main event. The entire reason we went to these countries at this time for our honeymoon was for the Formula 1 race in Spa-Francorchamps. This was AMAZING! The coolest part, in my mind, about wearing this shirt at the race, because Formula 1 is coming to Austin in 2012…very fitting I thought. Here is my husband and I. I’m wearing the Bikeman shirt. So there you have it. Two pretty sweet places that the Austin shirts have been! How about you…where have you taken your PassingLEFT shirts? Post them on Facebook…it’s fun to look at! About Jen with 1 ‘n’: I’m a graphic designers and photographer based in Austin, Texas. I designed the two Austin shirts and had so much fun working with PassingLEFT that I asked Jenn with 2 n’s if I could contribute a blog post from time to time. You can catch me on Twitter and view my graphic design and photography portfolios.